What are Lock Tight Dentures? ​Lock Tight Dentures are a unique denture support system that use Dental Implants or Mini Dental Implants (MDI) to support a complete denture. 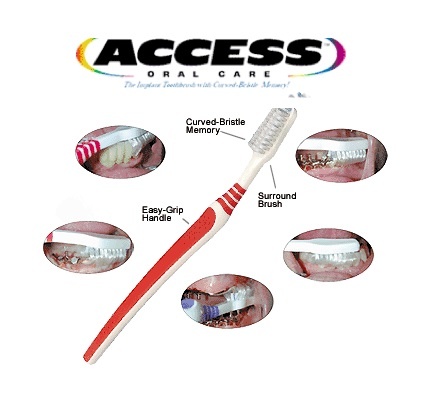 They can be used on upper or lower dentures, allowing your denture to lock tight into place. This means a lower denture that no longer moves around, or an upper denture that doesn’t cover the palate, which can eliminate gagging problems. Yes. After providing satisfactory technical and clinical evidence to that agency that the product was safe for public use and in fact had beneficial attributes, the FDA granted its formal consent to market the Mini Dental Implant device not only as a transitional or temporary dental product, but significantly, as a long-term item. What is the primary and most effective use for Mini Dental Implants? The most effective use of this unique dental product is stabilization of a lower denture. There are approximately 50,000,000 people in the United States who are “edentulous” (literally meaning lacking teeth) who struggle daily with prosthetic devices. A majority suffer a great deal of discomfort as a result of lose or ill-fitting dentures. Many denture wearers simply withdraw from any type of social engagement as a result of being compelled to wear them. Moreover, it’s not uncommon for family members to complain about a denture wearer’s disagreeable breath as a result of food being trapped and decaying under their denture prosthesis. Successful placement of the Mini Dental Implant addresses and solves all of these social and practical problems. Denture patients all over the world have experienced relief from loose or ill-fitting dentures from doctors who are trained to place the MDI. Uniquely, the MDI can be utilized to stabilize a denture in a couple of hours by Dr. Moorhead, with the patient leaving the clinic with a stabilized prosthesis. 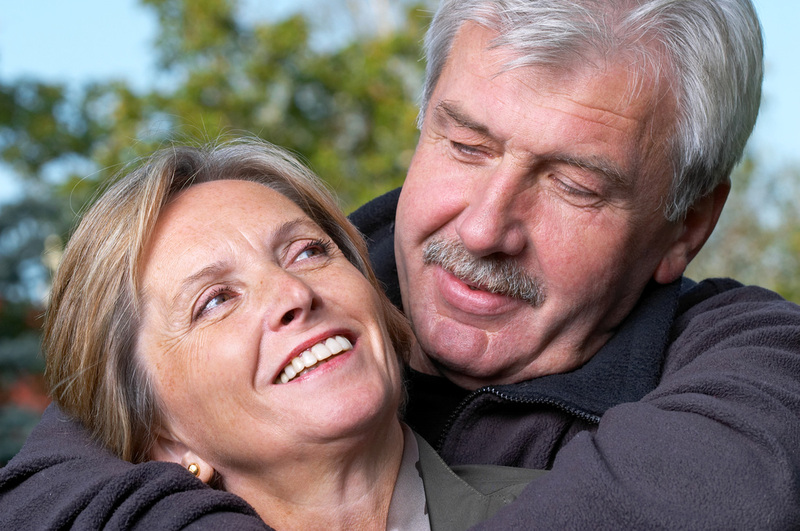 How, specifically, can Lock-Tight Dentures with Min Dental Implants help denture wearers? The standard insertion protocol for mini dental implants calls for four of them to be gently screwed into the front of a patient’s lower jaw. This is a relatively painless procedure that can be performed by a general dentist, requiring only a mild anesthesia. The mini dental implants, which are approximately the size of wooden toothpicks, are placed about five millimeters apart in the patient’s mandible. The patient’s denture is then carefully adjusted by the dentist to allow it to snap onto the four mini implants. The result? A tight fitting, completely reliable system that allows a patient to speak and eat with confidence. The Mini Dental Implants are placed in about an hour’s time. Because of the unique, minimally invasive procedure, the minute size of the implants, and the characteristic placement area, the typical Mini Dental Implant patient can enjoy a light meal an hour or so after having the mini implants placed. Further, a denture patient who has had his or her prosthesis stabilized with MDI can remove and replace the denture easily after a little practice, and can easily utilize good dental hygiene. All in all, the MDI is quite satisfying. How can these tiny dental implants withstand the tremendous forces the human jaw endures while chewing food? It’s true that what the dental profession calls occlusal forces create dynamic pressures on the human jaw. Our jaws are marvelously designed to adequately withstand those forces. It’s also true that mankind has been struggling for centuries to come up with some type of metal or metallic element that can efficiently withstand those forces. Most have been outright failures. However, approximately twenty-five years ago some doctors around the world began experimenting with titanium as a potential dental medium. Titanium is an extremely strong metal used in the construction of aircraft and aircraft engines. The metal, in its commercial form, is incredibly strong and durable. The Sendax Mini Dental Implants takes that metallurgical concept to the next level by adapting an industry approved alloy of titanium. The result is the strongest metal on earth, now commonly referred to as titanium alloy. In fact, extensive tests conducted several years ago by the University of Alabama-Birmingham School of Orthopedics revealed that the particular titanium alloy implants used in the IMTEC Sendax Mini Dental Implants are 64% stronger than ones constructed of commercially pure titanium. The bottom line of this discussion area is simple: If a denture patient has sufficient bone mass to create a rock hard placement of the tiny implant, which an experienced dentist can usually determine by an initial examination, the mini dental implants will generally withstand normal chewing forces just like natural teeth. Fractures are extremely rare, but as the case with a person’s normal teeth, can certainly occur. It must be recognized that all implant systems as well as natural teeth are subject to potential failure due to natural causes, including osteoporosis, poor oral hygiene, wear and tear attrition, poor health, heavy, stressful biting habits, and lack of followup dental maintenance care. Mini implants similarly do not carry any actual or implied guarantee as to longevity. However, the loss of a Mini Dental Implant is a far less critical event to the patient since it may be replaced at relatively minimal cost compared to conventional implants, and with minimal associated bone or gum deterioration. As a revolutionary departure from routine dental implant methods, Mini Dental Implants are so narrow they are typically inserted directly through the overlying gum tissue and into the bone underneath. Consequently the need to surgically cut and “flap” open the gum tissue, routinely required for standard implant systems, is avoided in most Mini Dental Implant applications. As a result, post-insertion patient irritation and soreness is significantly reduced. While all dental implants require care during insertion to avoid encroaching on vulnerable nerve, sinus or bony structures, the ultra small width of the mini implants offers a much more comfortable margin of safety. What type of surgery is involved to place the Mini Dental Implants? A single procedure is needed for insertion of the Mini Dental Implants. The implants are then put into immediate biting or “loading” function thanks to their “self-tapping” design, thereby anchoring a fixed bridge system. 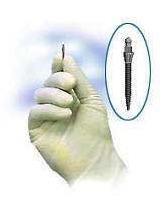 As a result, it is often possible to provide the complete mini implant service in a single office visit. Mini dental implants clearly represent an enormous breakthrough for the dental implant specialty as the most patient-friendly, cost-effective, proven dental implant system available today. How do I place and remove my Lock-Tight dentures? The Mini Dental Implants and O-ring fixture must be clean and free from debris. Grasp the denture with both hands and lightly seat the denture, feeling that the Orings are resting above the ball head of the implants, then press down firmly and equally on both sides. 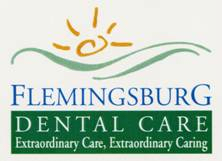 Make sure that you feel the implant heads easily fitting each O-ring. You will feel the denture snap into place. If you have trouble seating your denture, first make sure the implants and your denture are absolutely clean. Secondly, make sure that you push downward equally on both sides. If you are still experiencing difficulty, see if a family member can give you assistance. To remove the denture, place your thumbs under each side of the lower denture rim and gently push both sides upward at the same time. What is a typical daily routine one might expect once they have Mini Dental Implants? As with all dental applications, there’s a short adjustment period during which time you become comfortable placing and removing the denture. Typically, this involves removal of the lower denture in the morning, brushing the gums and implant area with an ACCESS curved bristle toothbrush, rinsing the mouth, rinsing the denture itself, then replacing it. You must clean and brush the ball of the implant as if they were your natural teeth. As with natural teeth food and bacterial debris must be removed or inflammation of the gums will occur. In addition, food and debris can be forced into the O-ring fixture causing improper seating and loss of retention. The O-ring fixture must also be cleaned out. The result is a normal day’s activity for you, including eating, talking, taking a nap, etc. Then, in the evening, the denture is usually removed again, the ACCESS brush is used, and the mouth thoroughly rinsed. The result is a fully functioning dental appliance that works. I have heard that standard dental implants are quite expensive. How does the cost of Mini Dental Implants compare? Mini Dental Implants are surprisingly affordable, and are usually available at a fraction of the cost of traditional implants. By choosing the MDI, you’ve chosen an enhanced way of life free of a lot of the discomforts and heartaches of a loose or ill-fitting denture. That’s worth a lot.